With all the hype about expensive high end gear, this set is a refreshing relief for the budget minded. The pot is extremely tough and I have used the same one since they came out. I replaced the standard cups with a stainless cup and now my entire cook set fits inside the pot. For the $15 that it cost me, I couldn't be happier with this pot. A lot of people seem to think that the cost is directly relevant to the quality. In some cases I agree, but not with this set. Straight out of the box, it is fairly impressive. 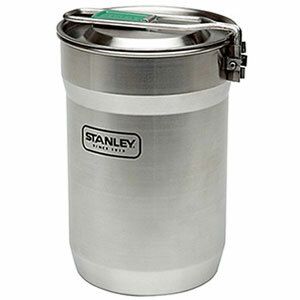 Stainless steel construction with a very strong handle that when squeezed can fold across the lid and snap into place. I don't have to worry about my stuff falling out of it when it turns over. I replaced the factory plastic cups with a single stainless cup that fits perfectly into the pot. The saved space allows me to store my hiking stove, utensils and seasoning bottles all inside the pot. Truthfully, the only thing I can really say I didn't like was the plastic tab on the lid. It melted off the first time I cooked with this pot on an open fire. This was actually a blessing in disguise because to replace the tab, I used a large key ring. 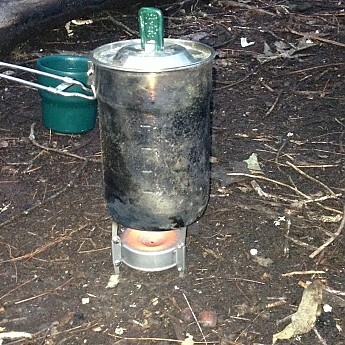 Now, with the handle locked in place across the lid, I can hang the pot from the key ring over the fire under a tripod. The cups that came with the set are decent quality, but they are fairly small. I removed them and put a stainless steel cup in the set that fits perfectly into the pot and essentially takes up almost no space. I like the measurements being stamped into the side of the pot because it takes any guess work out of preparing dehydrated backpacker meals. I will usually cook everything right in the pot (instead of pouring water into the bags) and eat straight from the pot. This eliminates the need for carrying a bowl to eat out of. I have used the same pot for several years now with no complaints. It cleans up easy and stores away in my backpack. I do wish Stanley would make a smaller one. The 24-oz size is usually more than I need for most situations. Overall, I would recommend this product to anyone that doesn't want to spend a fortune on a cook pot. I've used the high end titanium pots and the only difference I could see was the weight and the cost. I completely agree. You do give up some things with lower cost items (weight comes to mind), but I have a $15 Sears jacket that keeps me as warm as a $200 NorthFace jacket. Welcome to Trailspace, Brian! Thanks for the helpful review of your cook set. I have the same pot and cups and love them. I was surprised at how much of a beating it can take. I was also surprised that I opt for this cook system as much as my jet boil. Thanks. I have had my green Stanley thermos bottle since the late seventies. Kinda ugly now, but still works great! Larry, we'd love to see a review of your Stanley bottle! That's not a half bad idea, Alicia! Let me see what I can do after Christmas. Thanks, Larry! It's especially nice to see reviews of gear that has been in use for many years. This is a very sturdy set. A little heavy. Set wt. This is a very sturdy set. A little heavy. Set wt. 13.8 oz. or 390 g. without the cups 7.8oz. 220g. I found to use it without the cup. A canister fuel can will fit inside with a small stove and small spork. The lid is vented and you can strain with it and the lifting tabs locks up. The handle locks in tight. Measures on side to 20 oz. can hold up to 24 oz. I bought it for around $14.50 at Target. Well worth the money. Would work real good for younger hikers or others hard on gear. would be great for scouting. One cup wt. 3oz. I have used this cook set on two scout hiking trips. For dehydrated food and such this set never fails. Three of my scouts have this set too. I got this set to show them. The kids are hard on gear. They don't have any dents in their sets, so it's almost bullet proof. It will take longer to cool down but on the other hand it will stay warm longer. If you do burn something in it you won't have to worry about scrubbing too hard. The handle will get hot, but not too bad. The handle locks down tight. About 6 strainer are in a row on the lid, so you can strain water out. The tap for lifting the lids locks straight up. You can do some measuring on the side. IT does hold about 24 oz total. I didn't use the cup. Heavy duty cups. Price for this set is real good. I can fit my canister fuel in it with a pocket rocket, spork, and lighter. Great for lightweight hiking or compact car based BOB. Love this thing! Its best use is heating water. Second best is heating canned items. Third best at noodles/rice/beans. Does not fry anything lol. If you caught a fish you will have to clean and dice it, but that may be just what you want to do to add to your rice. Search for the key ring mod and drill two holes for the ultimate in flexible cooking potential! Love it. Would have given five out of five. Probably will if I can learn to poach my egg instead of fry. This is the perfect size cookset for an alcohol soda can stove with a windguard/potstand made from a large soup can. The stove and fuel can easily fit inside and the large soup can slides right over the exterior. 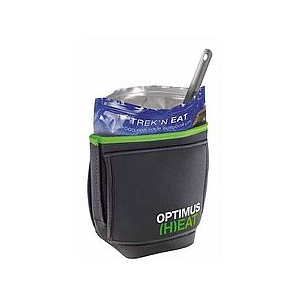 The two insulated cups make it so you can easily eat your food while it is still hot. The lid reduces cooking time, but it can also be used as a strainer. The handle folds away nicely and does not get hot. It is the perfect size for certain stove designs. It is heavy with both cups. 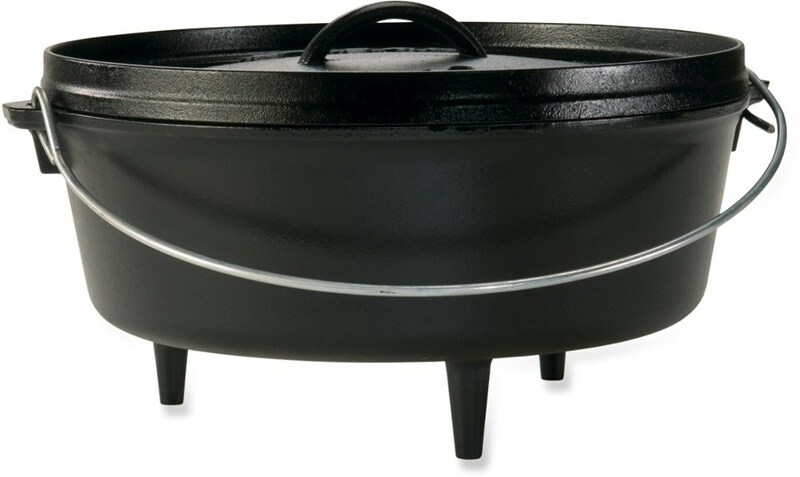 This cookset is the perfect size for an alcohol soda can stove and a windguard/potstand made from a large soup can. The soup can fits snugly over the lower end of hte pot and the stove will fit inside the nested cups inside the pot. I like using alcohol for fuel because it can also be used as part of the first aid kit. 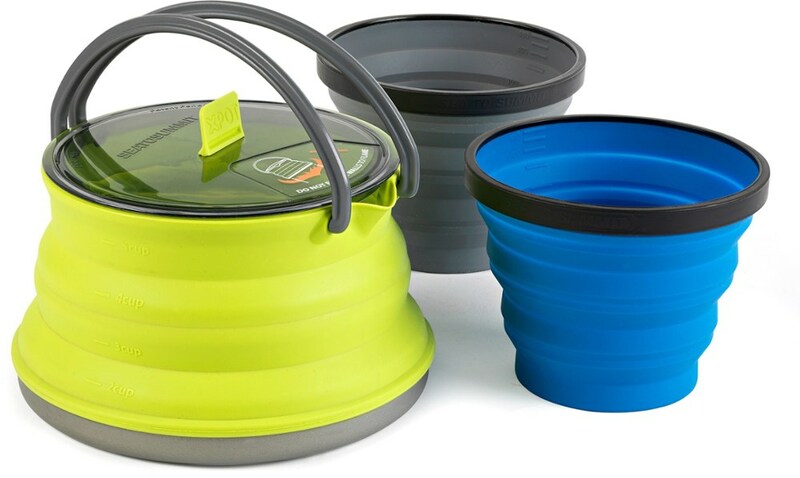 The handle folds over to hold the lid on while packed and locks in place when in use. 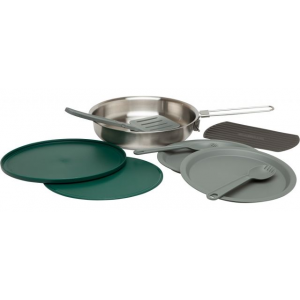 This cookset is durable and easy to clean. If traveling solo, the cups can be left at home to save weight. I have used this with a homemade white box style alcohol stove and it works great. Solid and dependable. Very well thought out. 8/3/13 Update: Even with all of the kits I have, I keep going back to this pot. The handle and the lid are what make the biggest difference. I made a small whitebox style stove from a 8.5oz aluminum Coke bottle and it is crazy efficient with this pot. Love it. I bought this little unit because I like to test different products with my different alcohol stoves. I have to admit that this is one of my favorites. Sure, it is heavier than TI, but I think you are better off saving those ounces somewhere else. Don't get me wrong, I really like my two Snow Peak TI cooksets, but for the extra money, are they worth it? The metal lid is a nice feature when using alcohol stoves. The higher flame scorched the silicone lid on my Snow Peak hybrid unit and started to melt the edge on the clear plastic lid on my GSI double boiler. They are both great, but best used with a gas stove. If you are planning on using alcohol or wood fired stoves, this is a good solid choice. Great pot if you're on a budget. It's not an ultralight cook set so treating as such will only disappoint you. The pot is 6.5 oz, lid 1 oz, and the cups 2.8 oz each. The handle of the pot is very sturdy. Looking for a way to replace it with something more minimal to cut weight. I usually leave the lid and cups at home and use foil as a lid and a small styrofoam cup for coffee. Using the pot in conjunction with a Fancy Feast alcohol stove and it boils up fine. The handle is far enough away to not get super hot. Did I mention it's only $15?! It's a very sturdy product all around. The only part that may need changing is the plastic tab on the lid. I would have gladly paid the same price for only the pot. Down the road I may switch to a more expensive titanium pot, but for now I can't justify spending upwards of $50 to save 2-3 ounces. The fancy feest with the tomato can and carbon felt cloth is a great match for this cook set. Just need to add a DIY pop can wind screen. This is simple and effective for my uses. Not too heavy. If you want a durable decent cookset for one that's not too expensive this is for you. I really like this cookset for boiling water for dehydrated meals. I use it for backpacking. While not ultralight it's fairly light at 10.5 oz with 1 cup in it. I only use 1 cup as this is for me. A PocketRocket stove, lighter, and 2 coffee "singles" bags fit inside with ease. Which is how I carry it on a weekend trip. Easy to clean. I also like the handle locking positions. It holds the lid on when not used and doesn't get too hot when in use. Price Paid: appx. $15 at Walmart. The prices may have gone up some, had them two years. This little and compact cook set has saved me from endless hours of cooking when at the base camp! I own at least 10 of them...read on below! 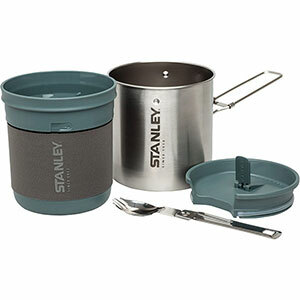 Great complete cook set for the solo hiker! Good for 2 people for cooking a side dish to main meal. Great for base camp uses. Very sturdy, easy to clean and self contained! A little heavy for some packs. Traded out the plastic top tab for O-rings, won't melt. Well, I can't say enough good about these little sets! I own at least 10 of them, no joke!!! Short story why I own so many. Us ladies seem to spend more time cooking than the guys do. It's just a fact most of the time. Well, I love to cook BUT I also like sitting and talking and enjoying the fire and all the things that make being back at base-camp more fun. These cook sets help me do that! I bought them and gave each person one to cook their own foods. Each person had fun cooking and the cleanup is so easy they didn't complain about it. This thinking, of course, allowed me to join in cooking and cleaning with everyone else, at the same time, and I could relax afterwards, at the same time. It just turns into a fun group-cooking experience, perfectly. Now, about those two cups that a lot of people ditch first thing. Don't. They are great little side dish cups for fresh fruits, oatmeal, mac-n-cheese, dips and even for small salads. Think outside the box and different uses will come to you. So, yes, even when group hiking or at base-camp each person can be a *Solo* and everyone has time together - cook some, relax some. It's a perfect fit for everyone 10-110 yrs old. And cleanup is a breeze! Thanks for the review, Pamela. I'd love to see some pictures of your set (or all 10! wow!) and what's included. Alice, there's not much to the set really. The tall pot. The strainer lid. The two insulated cups that fit inside the tall pot. That's pretty much it. 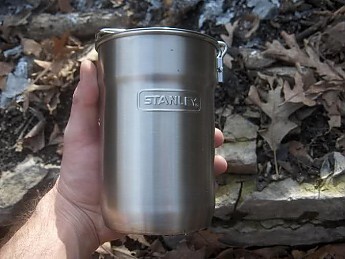 Its stronge suit is quick and easy, plus the strainer lid fits most of the regular style camp cups. Great for keeping that cup of Jo hot a little longer. Go to Flickr.com and search for CameraGirlUSA. 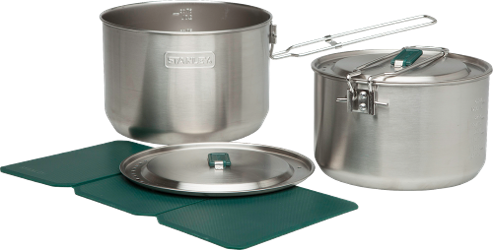 I have photos of the Trangia Mini-T 28 in use with the Stanley Adventure Camp Cook Set in action on there. I used it when hiking the Silver Comet Trail. that set up was a creative use for both of them, as I had forgot my windscreen. The caption explaning it is under the photos. I have 2 of these. I'm a lightwieght backpacker (not UL yet) and scout leader. I use it for myself and my 2 sons share the other one. Sometimes we go seperate directions and need our own cookset. Just right for a canoe trip where weight is not an issue. Heavier than expensive sets, but worked great! Reasonable price. This just might replace my GSI set. Smaller footprint and simpler. I currently use a GSI Dualist cookset. I got the Stanley because at this price I couldn't pass it up. As soon as I find a way to pack my cat can stove and fuel inside this, it will be my go-to set. Typical Stanley ruggedness and I like the handle. 9 out of 10. A couple pros and cons, but all in all a good product. I got this product about two weeks ago. It is made in China, which is not ideal for me, but it is good, still good quality and works fine on a grill or over a fire, but be aware if the flames are reaching the side it does discolour the stainless steel. Also if you are cooking on a fire soot does build, but can be washed off. This is a perfect mess kit for one or two people (if they're both minimalists). Lightweight. This inexpensive kit is perfect for a backpacker. This is well made, but does not fit well on our backpack stoves--too small. Also it does not use stove fuel efficiently being such a small diameter it takes longer to boil water than a larger pot. We tried this out making mac and cheese for a picnic. Took a lot longer to boil water due to the small diameter. Would only fit on one of our stoves due to this also. It is nicely made and the cups feel good in your hand and keep tea warm, but are a bit heavy. Good idea but for me too heavy. Very versatile and ingenious idea! The cups were the main weight, although you could always leave them at home. The other thing that I thought was an issue was the handle. The lid is super cool has a couple holes for vent. I think it was clever, just they lost me when it came to the weight. Not sure on weight since I don't own a scale but my hands sure know when something is too heavy for me! I found mine at Target and also saw it at Walmart. Could see it lasting for years very durable. In the end I decide not to get it.